ALBANY, NEW YORK — MARCH 26, 2019 — Rivkin Radler LLP one of the Northeast’s leading law firms, has leased the entire 11th floor at 66 South Pearl Street for its new Albany office. The Firm will occupy over 10,500SF and additional rooftop patio space. This move is both an expansion and relocation for Rivkin Radler who merged with Albany-based Iseman, Cunningham, Riester and Hyde (ICRH) in July of 2017. The Firm is moving from 9 Thurlow Terrace, in Albany. Rivkin Radler also has offices in Long Island, New York City, New Jersey, and the Hudson Valley. The Firm has more than 190 attorneys and specializes in 21 cross-disciplinary practice groups. “This is an exciting expansion, as we look forward to continuing to build our presence downtown and across the Capital Region into a larger, more centrally located office space.” said Rivkin Radler Managing Partner Evan H. Krinick. “The move will further enable Rivkin Radler to retain, attract and grow our legal talent and disciplines, in addition to providing much needed Class A office space,” said Rivkin Radler partner John F. Queenan, who is resident in the Albany office and serves as a member of the Firm’s Executive Committee. 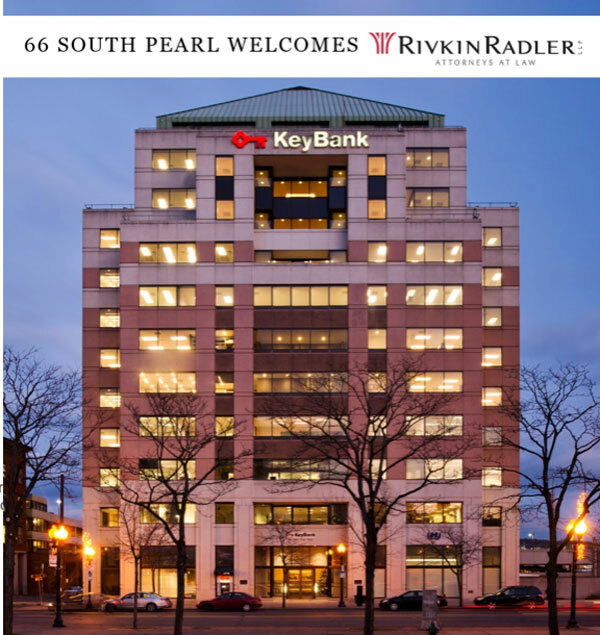 “We are pleased to welcome Rivkin Radler LLP to 66 South Pearl Street. The firm’s decision is a continuing sign that major employers recognize the value of locating within our downtown communities,” said I. David Swawite, President, Omni Development Company, Inc.
Peter W. Struzzi, SIOR, Jeffrey D’ Amore, and Joseph Mahoney of Cushman & Wakefield I Pyramid Brokerage Company negotiated the lease on behalf Rivkin Radler and the landlord in the deal, Omni Development Company, Inc. D’ Amore and Mahoney are the exclusive leasing agents for the 174,000SF Class A office building at 66 South Pearl Street. Established in 1950, Rivkin Radler LLP has offices in Albany, NY; Hackensack, NJ; New York City; Poughkeepsie, NY; and Uniondale, NY. The firm is nationally recognized and was named an American Lawyer Media “Go-To” Firm by its clients. In addition, the firm is among the National Law Journal’s 350 largest firms in the U.S. For more information about the firm, visit http://www.rivkinradler.com/.